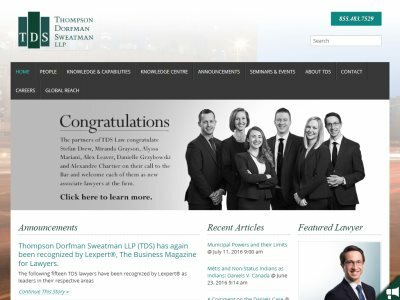 Thompson Dorfman Sweatman LLP (TDS Law) is a full-service law firm in Winnipeg, Manitoba. With additional offices in Boissevain, Brandon, Carberry, Gladstone, MacGregor, Morden, Portage la Prairie, Steinbach, Winkler. With more than 125 years of service to Manitobans and to the legal community. Provides services in over 20 areas of practice including: corporate and commercial law, labour relations, employment law and civil litigation, and advocacy and dispute resolution.